This is one of my favourite necklaces! A combination of graduated champagne coloured, faceted swarovski beads make up this 18" necklace. 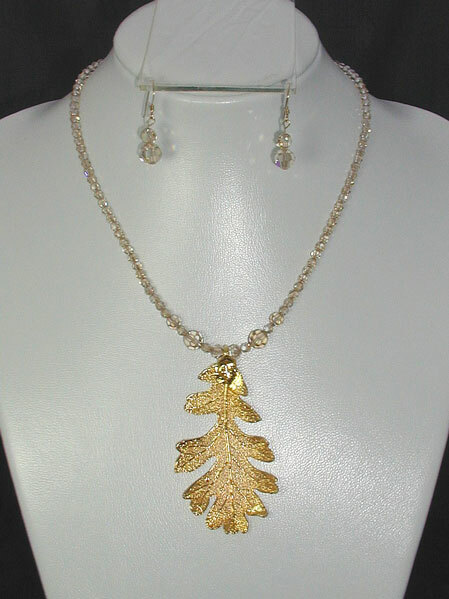 The subtle golden coloured beads really compliment its focal point of a 3" real oak leaf pendant.This leaf has been covered in gold, looking like a skeleton leaf but solid and showing a lot of detail. These leaves really show the beautiful side of autumn and are an original way of pursuing this seasons metallic trend. To compliment this necklace you will also receive swarovski drop earrings in the same colour beads as the necklace with gold filled (hard wearing) ear wires.